Trials come in various shapes and sizes. It's how we respond to those trials that determine who we really are. 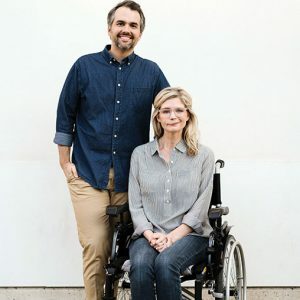 Katherine Wolf, joined by her husband, Jay, talks about the massive brainstem stroke she miraculously survived just months after giving birth to their son. The Wolfs recall what drew them together as college students and what their life was like on the sunny California coast before this life-altering trauma. Bob: — it’s likely you would have been a widower by the end of the day. Jay: Yes; absolutely; and it was likely that I would still, even when she was taken to UCLA. Jay: So we didn’t even have a doctor—we were 26—we were just kind of footloose / fancy free. You know, all of a sudden, in a moment, our life was turned upside down. We were rushed to what we learned was the #3 hospital in the country. God had really been preparing the way for Katherine to survive, but it was going to be against all odds. Bob: The cafeteria at Samford University; right? Dennis: That was a signal. Jay: I was like, “That was subtle.” [Laughter] But then, he was out of the picture a couple months later. Dennis: I want to find out—spiritually, where were you two? Were you on a growth trajectory? Jay: Well, that’s alright. Now, I’ll speak for you. Jay: So Katherine had been poured into her whole life as well. Jay: “My faith— is my faith my own?” You know? And Katherine has been a huge catalyst in my life to this day—now, in different seasons—to have God reveal Himself to me. Katherine: So I feel like our whole lives were preparation for this. Bob: Katherine, you guys got married between the end of undergraduate and the start of law school. Bob: Tell us how your husband proposed. Katherine: Oh, got it! Well, Jay’s father’s the pastor of a church in Alabama. He tricked me into thinking we were going to see some friends at a nearby restaurant down in his hometown for dinner. Our college was a little over an hour north. We came down, and he said he had to run back into the sanctuary to see something. Then I followed him in. To make a long story shorter, he had meticulously planned every detail of the next ten minutes, starting with this incredible—I don’t even know what you would call it. Jay: Display of pictures from our life. Dennis: He was kind of presumptuous that he put your name on the Bible. Jay: I thought that might push her over. Bob: You put some time and effort into that. Jay: Yes; yes. I figured that this was the time to plan and go all out. I might as well! Bob: You do it once. Jay: Yes; that’s the idea. Bob: The move to California was, in part, for you to go to law school at Pepperdine. Bob: But it also coincided with opportunities that Katherine had, vocationally, as well. Katherine: Yes; I’ve always been shy! Jay: But she had some opportunities, growing up in theater, and just always kind of drawn to theatrics and the entertainment industry. She was doing some kind of commercial print modeling in the southeast—so then had an opportunity to do that in sort of the big city of LA. God just made it really clear that I was going to go to Pepperdine Law School / Katherine was going to maybe seek this entertainment industry—whatever that looked like—as a career. Then He brought it together, you know, so that the timing worked out. That was what really led us to LA together after we got married. Bob: Your three law school years were pretty idyllic; weren’t they? Jay: —which is very iconic “on the beach.” It is beautiful. So we lived in the married housing dorm, which we always used to say it was like we lived on the beach in Malibu because you could kind of—through the parking lot, you could sort of see the ocean in the distance. It was just magical, really. We plugged into this great church—that we still go to—to this day—called Bel Air Pres Church in Los Angeles. We just really plugged our lives into it. That was really some of the best advice that we were ever given— was to jump into a community of Christ’s, early on. Dennis: And you two immediately started teaching a young married class? Jay: Yes; for some reason. Dennis: You were one step ahead of the hounds! Katherine: It doesn’t make any sense! We do not know why they let us do that, but there was a need in this massive Sunday school class, as we used to call it—they now say Discipleship Group—to have leaders. Here we were, bright-eyed and bushy-tailed, and 22 years old. We say, “Sure, we’ll lead it!” It just kept growing, and growing, and growing—and was just this weird, beautiful, messy picture of the body of Christ. It was deeply informing to us about marriage because, here we are—reading books about marriage / learning about Christian marriage / learning about how to counsel other people in their own marriages and their own marriage problems. Jay: Going to a Weekend to Remember ®, actually, too. Jay: Yes, during that same time. Katherine: We actually attended a Weekend to Remember with that class! Katherine: But what was so cool that the Lord was doing was—we thought we were doing this for everybody else—[Laughter]—that we were really putting in the time when we were so young. Jay: That is so true. Katherine: “We would never need marriage counseling. Please!” And here we were— just a few years out from something that is just like a bomb dropped on your marriage. Katherine: We needed all of that good stuff that we had learned. Dennis: Well, there wasn’t a bomb dropped on your marriage, but I want to go back to the day when you had the stroke. Dennis: —because you were told it was going to be six to eight hours of surgery. As Katherine has already shared, it went sixteen. Dennis: I am just wondering what you were thinking. Jay: — trough Facebook®. You know, this was the time when digital things like Facebook were really just getting accessible for everybody. That night—I remember, you know, there were about 100 people that gathered. It was really—I’ve never experienced church like that in my whole life. We prayed, and cried, and, you know, we read Romans 8 together. I said: “I’ve got to stake my whole life on this. I can’t just read it like some rote thing—like, ‘Do I believe this?! I’ve got to—with everything I have.’” So, there were moments like that— that night—that really bolstered me for what lay ahead because it was a complete shift in the trajectory of both of our lives. You know, God was gracious just to give us hope through His people. Bob: Were you thinking, “I’ll probably be a widower,” or were you thinking, “She’s going to make it.” Are you an optimist or are you a pessimist? Jay: It’s funny; I’m not. Katherine’s the optimist. I’m probably more of the realist; but then, some of this experience has probably sort of shifted some of that perspective, or at least, brought us both toward the middle. I think—you know that I grew up as a pastor’s son in a big church, where dad would have to get up and go to the hospital. You know, he did funerals for kids and just all kinds of suffering was around. Dennis: Yes; you were given some grim news. Jay: Yes; it was very grim because— basically, for this world-renowned neurosurgeon—this was the largest of this type of malformation he had ever encountered. It was in the worst place, right by the brain stem, of course. You know, you can’t really mess with the brain stem too much without totally creating havoc. And then, it was bleeding so much that it was herniating her brain. So the odds were very much against any kind of positive outcome, much less the one that ended up happening. Katherine: So pretty much, I’m a miracle. Cool!! [Laughter] Thank you, Lord! Katherine: No, it’s not anything that they could trace back to heredity or anything. It’s congenital—I was born with it—but I’ve subsequently had a second aneurysm. The first rupture was an AVM, but I’ve actually had an aneurysm I had to have removed several years ago. There is clearly something wrong with my whole vascular system, but that was congenital. Jay: But you had no symptoms. Jay: Never saw it coming. Katherine: Yes, nothing. We didn’t even know if I had insurance. I didn’t even have a medical doctor when this happened. Katherine: I mean, nothing!— perfectly healthy. Dennis: —I’ve got to read it—it is verse 28. Katherine: Would you rather me quote it? Dennis: You know what? Why don’t you?! Katherine: I would love to! Romans 8:28 says, “And we know in all things, God works for the good of those who love Him, who have been called according to His purpose.” Do you want me to go on?—because there are some more good ones real quick. Katherine: Romans 8:31 is such a fabulous verse / Romans 8:37—should I quote them all? Do we have time? “We are more than conquerors through Him who loved us, / No one can separate us from the love of God.” Should I actually quote Romans 8:38? Bob: Might as well keep going! Katherine: Alright! Well, if we start with: “…If God is for us, who can be against us? He who did not spare His own Son, but freely gave Him up for us all, how will He not also freely give us all things? Who is he that brings any charge against those whom God has chosen? It is God who justifies; who is he that condemns? Christ Jesus who died, more than that, who was raised to life and is interceding for us.” I could go on and on! Bob: Katherine, you sit there and say that with double vision, in a wheelchair, with a half-paralyzed face, with loss of all kinds of function, and I still hear a joy in your voice that seems to contradict what you just said. Dennis: There are some listeners who needed to hear your story today. Dennis: And hope does heal. —we have been spending this year celebrating anniversaries with a lot of our listeners. In fact, last week was my 37th wedding anniversary. Today, we wanted to say, “Congratulations!” to Mark and Tami Kelley, who live up the road from us here, in Bella Vista, Arkansas. They are listeners to FamilyLife Today. They listen on KLRC and have been to the Weekend to Remember. They have hosted The Art of Marriage® in their community. It’s their wedding anniversary today. We think wedding anniversaries are a big deal because we think commitment in marriage is a big deal because we think every society succeeds or fails, in some measure, based on the commitment that a husband has for his wife— to love, and to honor, and cherish, and nourish her—and the commitment that a wife has for a husband—to love and honor him as well. I know that a number of our listeners feel the same way about this issue of commitment in marriage because many of our listeners have joined us over the years in helping to support the ministry of FamilyLife Today with donations. That’s what fuels this ministry—is your partnership with us as a donor. We have recently had some friends, who have come to us, knowing that summer is just around the corner. They wanted to make sure that we were prepared for what is often a slow season for us in the summer months, when donations tend to be a little lower. They have agreed that, between now and the end of May, they are going to match every donation that we receive, here at FamilyLife, on a dollar-for-dollar basis, up to a total of $350,000. We have about a week left to take advantage of this matching gift, and we’d like to ask you to help us do that. When you make a donation today, your donation will be doubled, thanks to this matching gift. You can donate, online, at FamilyLifeToday.com; or you can call 1-800-FL-TODAY to donate. Now, tomorrow, we’re going to hear more from Katherine and Jay Wolf about the journey that God has had them on for the last eight years. I hope you can tune in to be part of that.